This is a great film and I'm no sports nut. In fact, you don't really have to know much about baseball to get into the story as this is more of your classic underdog trying to win by beating the system by going against the grain. Moneyball is based on Michael Lewis's 2003 book of the same name about the 2002 season of the Oakland Athletics baseball team. Their general manager Bill Beane, faced with the insurmountable problem of trying to put together a winning team with one of the lowest budgets of any team in the sport, decides to break with the traditional means of scouting and analyzing players and use sabermetrics, a sophisticated use of baseball statistics. Unlike the richer teams who can hire the "best players" by paying a small fortune, Beane goes after players who are undervalued by using a statistical analysis of their playing abilities. The movie clearly demonstrates that the traditional evaluation of athletes may be missing some great finds out there in the market. As further proof, my follow-up research shows that many teams have followed Beane's model and are actively using "sabermetrics" to analyse their players. It is a fascinating marriage of instinct and science. In a nutshell, this is the statistical analysis of baseball. Considering over the years the number of sports fans or should I say sports nuts, who have enjoyed to no end citing numbers about this , that and the other thing about every sport under the sun, I would have to assume sabermetrics would be a (wet) dream come true. The Wikipedia article (see link below) lists off a number of terms like base runs, batting average on balls in play, equivalent average which sound a little strange to these uninitiated ears. However I do recognise the true baseball aficionado will be having a field day memorising all this type of information. If you're into something, you're into it and if you're into it, rattling off stats can be orgasmic. On the other hand, if you're not into it, hearing anybody listing off such figures can be seen as the height of nerdom. Keep that in mind before you start telling me the BFW and TPI of the guy with the bat stepping up to the plate. Columbia pictures bought the right to the book in 2004 and over the years, many people have been involved in the project. This screenplay was written by Steven Zaillian and Aaron Sorkin. While Sorkin's name is well known to me for writing the television series The West Wing and doing the screenplay for the film The Social Network, I did not know the name Zaillian. I do now. Check out Zaillian's list of films; it's amazing. Brad Pitt and Jonah Hill made for a great odd couple in this film. As I said, one important aspect of the story is the marriage of instinct and science, the old school traditions of scouting players versus the modern day analysis of statistics to hunt down undervalued players. It all makes for an interesting tale, one which does not require you to know baseball or to be a fan of it. This is a great film. It is well filmed, well acted and well scripted and very much deserving of its 95% rating on Rotten Tomatoes. Once again, a good story wins over car chases and special effects. Imagine that the budget of this film was only $50 million. I think of the zillions spent on some of this summer's blockbusters and am reminded that small can be better. Hmmm, does the film itself parallel its own story in that the underdog can win over the bigger players? Instead of spending a fortune on special effects, focus on delivering a good story. I thoroughly enjoyed this film and would highly recommend it. Director Bennett Miller, along with Brad Pitt and Jonah Hill, take a niche subject and turn it into a sharp, funny, and touching portrait worthy of baseball lore. 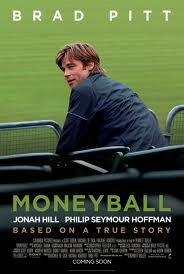 Moneyball is a 2011 biographical sports drama film directed by Bennett Miller and distributed by Columbia Pictures. Moneyball: The Art of Winning an Unfair Game (ISBN 0-393-05765-8) is a book by Michael Lewis, published in 2003, about the Oakland Athletics baseball team and its general manager Billy Beane. Its focus is the team's modernized, analytical, sabermetric approach to assembling a competitive baseball team, despite Oakland's disadvantaged revenue situation. Sabermetrics is the specialized analysis of baseball through objective, empirical evidence, specifically baseball statistics that measure in-game activity. The term is derived from the acronym SABR, which stands for the Society for American Baseball Research. It was coined by Bill James, who is one of its pioneers and is often considered its most prominent advocate and public face. William Lamar "Billy" Beane III (born March 29, 1962) is a former Major League Baseball player and the current general manager and minority owner of the Oakland Athletics.